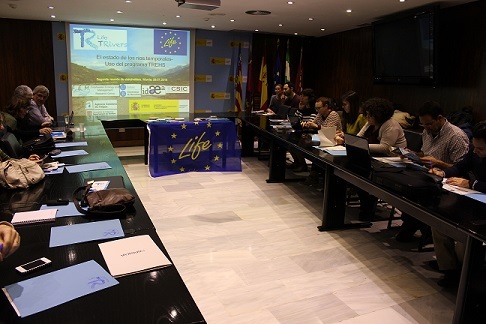 On 27 and 28 January, the second stakeholder meeting of the LIFE+ TRivers project took place at the headquarters of the Segura Water Agency, in Murcia. During the first day, a field trip to the Chícamo temporary river was organized. During the second day, the latest TRivers results, both hydrological using the TREHS software and ecological, were presented and stakeholders and experts involved in temporary river management had the opportunity to use the TREHS software with their own data and see the functionalities of the software. The field trip to the Chícamo stream, a tributary of the Segura River and one of the water bodies where the Water Framework Directive (WFD) need to be implemented by the Segura Water Agency, had the objective to show the ecosystem in question, and to find some of the methodological difficulties in assessing the ecological status of temporary rivers and the needs for their adequate management. During the field trip, samples of macroinvertebrates were taken and observed in trays directly in the field in order to determine the ecological status of each stream. The hydromorphological quality was also assessed with the help of participants. The smartphone app RIUnet, developed by the University of Barcelona, was used in order to make stakeholders familiar with similar products that will be developed in TRivers in the following years (i.e. TREHS app) and to make the activity more interesting. – Water managers from the Segura River Basin, the Júcar, the Tajo (from Portugal), and the Catalan Water Agency. – NGO’s such as Fundación Nueva Cultura del Agua. – Representatives of other LIFE projects implemented in Murcia such as Segura Riverlink and Júcar Water Agency. – Enterprises related with water resource management working with the Segura River Basin. – Representatives of the Council of water, agriculture and environment of the Murcia Region. 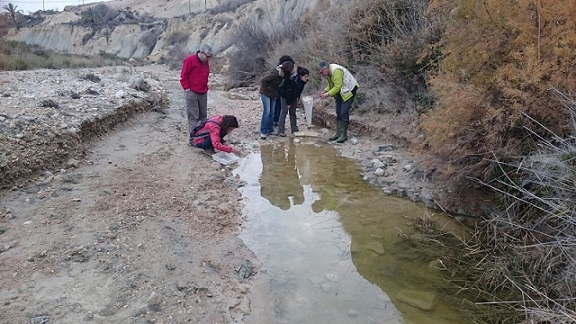 – Researchers from the University of Murcia who have devoted their work to study the streams and rivers of the region for many years. The session started with a presentation by the project coordinator, Professor Narcís Prat, who explained the TRivers principles, in which the software TREHS (Temporary Rivers Ecological and Hydrological Status) is based on. These are Aquatic States, metrics and graphs, and rely on two main ideas: 1) the macroinvertebrate aquatic life in a temporary stream is controlled by the temporal succession of Aquatic States or transient sets of mesohabitats occurring in a stream reach at a given moment, depending on the hydrological conditions. 2) using the statistics of the periods with/without flow, two metrics may be defined that allow the characterisation of the regime: the flow permanence and the seasonal 6-months predictability of the period without flow. 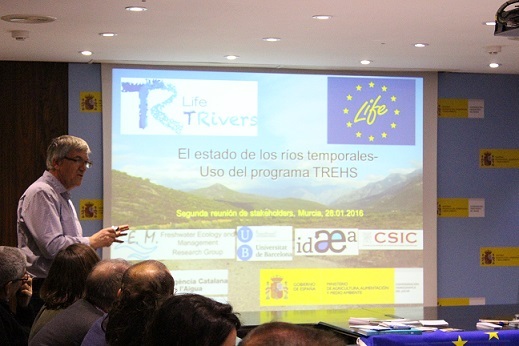 Aferwards, the researcher Francesc Gallart continued with a presentation on the application of TREHS in the TRIVERS pilot basins. Using observed data, predictive models and, as an alternative, surveys conducted among locals, the participants could see the evolution of a river’s aquatic states over time, the probability of zero flow periods throughout the year and determine if the river regime is due to natural changes or human intervention. The facility works as a data base, a tool for obtaining graphs and metrics for characterizing, comparing and grouping water bodies, as well as a decision-support system for assisting the choice of adequate references as well as to assess the degree of alteration of the regime (hydrological status). Núria Cid, freshwater ecologist and project manager of the TRivers, presented the recent results from the sampling campaign in 2015 on the ecological status in the TRivers study sites, which showed a clear change in biological quality in relation to the aquatic states. Besides, Teodoro Estrela, head of the Hydrological Planning Office at the Júcar Water Agency and also associated beneficiary in TRivers, presented their recently developed approach for assessing the status of ephemerals streams using stressors as a proxy for determining the status of these type of water bodies. In conclusion, participants’ opinions about the use of TREHS were very positive. Some of them stated that such a tool was really needed since long time ago. In addition, the meeting engaged stakeholders and scientists interested in ephemeral streams to organize a workshop lead by the Júcar Water Agency to be held in Valencia during this year. The meeting will be focused on the potential approaches to be used for determining hydromorphological conditions.